When it comes to interface customizations, Firefox is probably the browser that gives designers and users more options than any of the other popular browsers out there. Not only can you modify interface elements so that everything fits the way you want it to be, you also got access to two different types of themes that you can install. Complete themes can really change the way Firefox looks, as they not only change colors and that kind of thing, but may also modify the interface as well. Basic themes, formerly known as Personas, on the other hand only modify the color scheme of the interface but do not make any core interface modifications besides that. The new Firefox add-on Adaptify uses those basic theme capabilities to modify the browser interface based on the websites you visit. What this means is that the colors and background of the interface changes depending on the color scheme and backgrounds of the sites you visit. Take a look at two example sites to see how this can look like. It needs to be noted that things do not look that great all the time, especially if sites use a plain background color such as white or gray, as the chrome of the browser is then displayed in that color. Still, for other sites, it looks really nice and interesting. All you have to do is install the extension to get started. A new browser window is automatically loaded afterwards that encourages you to install a transparent Personas theme to improve the visual quality. 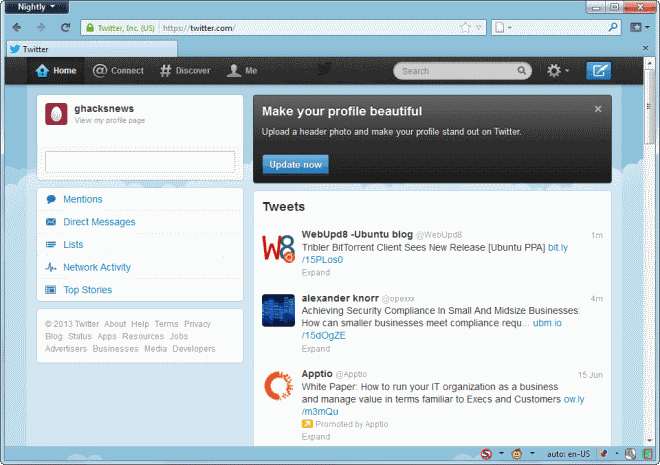 While you do not have to do it, it is recommended that you install the theme. Once done, visit any website to take it for a test drive. 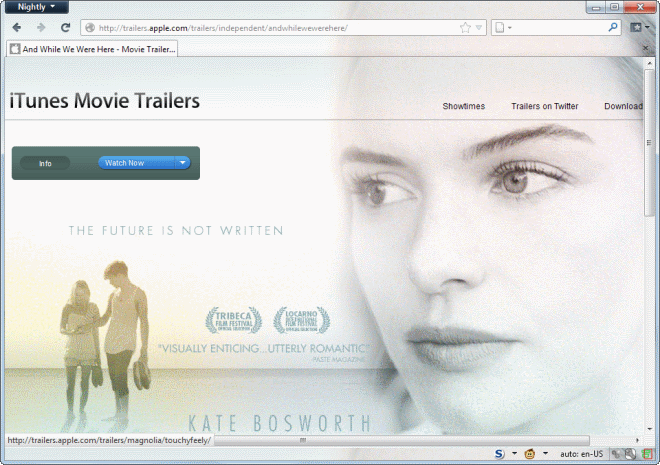 You will notice that the custom theme is applied to the main toolbar, tab bar and the status bar of the browser. As I said earlier, this works well on many websites. Sometimes, colors appear too dark though, especially if a site is using a black background color. Some interface elements, icons in toolbars and tab titles, become barely visible with no apparent way to modify that behavior. NoScript users need to enable scripts on the main domain before the interface gets modified on their system. An option to turn off the add-on on select websites, or use a whitelist approach to only turn it on on websites you specify, would come in handy. As would a button to disable the feature temporarily. WOW ! This add-on is excellent .. I’ll recommend this add-on to anyone ..Thanks for sharing this add-on with us mate ! At first I thought that it was cool and innovative, but after loading a few sites I began to hate it. It jerks and shifts the browser around, the menu bar has to be hidden or else you’ll end up with some whacked out stuff when loading things like about:addons. When I did that, I had nothing but tabs showing for toolbars and my desktop showing behind it. A few times it launched things in new windows, one of them full screen, so, it’s a nice concept, but not bug/annoyance free. I disabled all other add-ons and it still behaved the way that I mentioned. Fab Tabs was a great add-on until the developer became a sellout and sold it to ppclick. I don’t have issues with developers selling their add-ons, I just do when they sell them to shady companies that don’t give a crap about Firefox users and are just trying to exploit us. I do agree with this. I think that it has a couple of issues, like the too dark interface elements when the page you visit is dark as well. It is also impracticable if you switch between tabs a lot. Does this extension conflicts with GlassMyFox?